So after hearing about Tragedy Looper, I jumped at the chance to buy this and bring it to school to play with my classmates. Reading the rules though does not give you a good idea of how you play the game. Maybe its just me but even though theoretically I knew what the various terms are, I did not see how it all fell into place until I played my first game, so be aware! Now when you do play your first game, please be aware that you will probably spend almost 30 minutes trying to follow the script and explain the game before everyone can start to play. I mean the script provided in the game is useful but reading it out and then trying to understand the actions you have done AND answering questions from the players is no joke. After playing it two times, it still is tricky for me to explain it comprehensively and then be able to make good moves so as to win as the mastermind. Let's talk about the missions, specifically the first one since that was the only one I had played. As the mastermind, it will not be easy for you to win unless you play the HARD mode which gives the protagonists only 2 loops to solve and you will usually win the first loop. This brings me to another point. Typically the mastermind will win the first loop and if you are really crafty, you can probably make it such that the first loop ends with the protagonists all very confused. I will need to play more and as the protagonist to be able to see if this is a problem in the future. The game play itself, after you have gone through at least a day, is quite simple. It is just getting through the sequence and making sure everyone knows what actions are plausible and if they want to take those actions that may take some time and can be confusing. It doesn't help that the "resources" used in the game, paranoia and intrigue, does not help to make it intuitive to understand. I will elaborate on the game more in the future after several plays but for now though, I am still very "intrigued" about the game and will definitely hope someone can be the mastermind while I play as the protagonist. Moreover, those who have played protagonists did enjoy themselves and find the game very interesting and refreshing. So with those thoughts in mind, if you want to play it, do give it a try. It is not a simple game to get into but once you do, it should be quite a rewarding game and definitely much more interaction than your standard deduction/mastermind game. 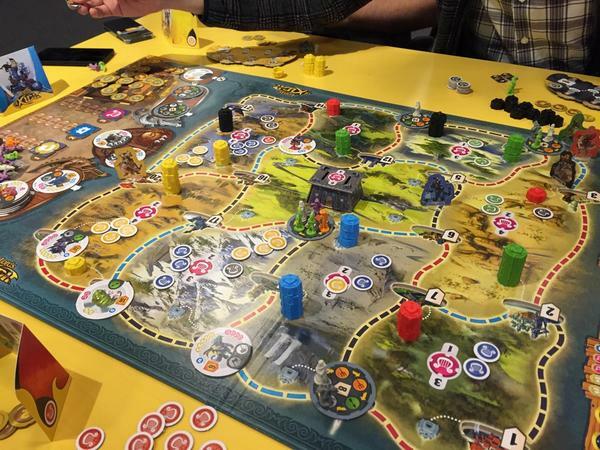 I was VERY excited to receive a review copy for Lords of Xidit and eagerly brought it out to try with my classmates. We had a 5 player game and after quickly going through the rules we began. Now the rules, while there are some parts that is slightly convoluted, it is relatively easy to absorb and play. Players program the 6 moves they intend to make for that year and then take each action in player order one by one. What a player can do is move or interact with a location. That's it really. At the end of every 4 years (total 12 years) players do a check of sorts to gain rewards for having the most units of particular types and then continue. At the end of 12 years, there will be a final scoring and there will be one winner. I REALLY LOVE this game. Even though I have only played it one time AND we got a rule wrong (you get 2 rewards when defeating a threat rather than one), I really really like this game a lot. All the players also did and after realizing the rule was wrong, we were all eager to try again and have a rematch. 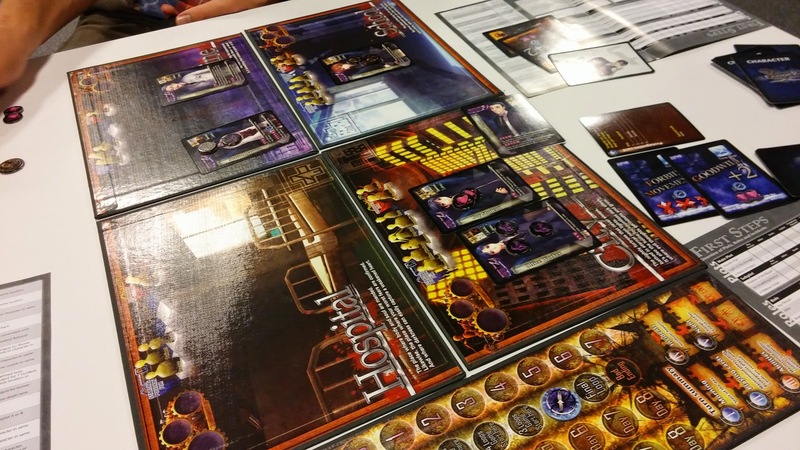 We were also enamored with this game because the artwork is functional and looks gorgeous. They used the same art as that of Seasons which is also published by them and the world which Lords of Xidit exists in. All the threats that you are fighting in the game came from Seasons as well! Game play is simple to get into but if you have competitive players, then it will not be so easy to win because the programmed moves depend on you being able to read what your opponents will do and in a 5 player game, your plans will inevitably be screwed. The end game scoring is also very unique. At the start of the game, you will randomly shuffle 3 tokens and place them onto the board. The 3 tokens are Magic points, Money and Culture points. What happens is that when the game ends, players will rank according to what is selected for as the first token, for example Money. The last 2 players who have the least money will be eliminated from the game and not eligible to win the game. Then the next token will be assessed (i.e. Culture points) and the last player will be eliminated. The final token will be assessed and you will then have your winner. This is a very interesting mechanism and ensures that players will try their best during the game not to fall behind in any of the 3 categories thus making sure the players are engaged during the game. You may also worry that the programming moves may take a long time but when we were playing the game, while some of us took some time think, when we were done and started executing the moves, it does not take much time and we zipped right through. There are a few minor kinks though. When a new recruitment tile appears in a city, it can be slightly tedious to setup the meeples available for hire onto the tile. The mechanism required to replenish the threat / recruitment tiles is also a little fiddly and when the Titans awake that is another tedious process. Speaking of Titans, they don't seem to be much point to them and don't feel like Titans. They don't trash the cities nor kill the players and not that difficult to kill and provide very lousy rewards. They feel like a catch up mechanism for people to grab some last minute rewards which is a pity. Finally, the game did take about 2.5 hours, much longer than the 90 minutes on the box. Luckily, we did not feel that it was lengthy and enjoyed ourselves. So in summary, we really enjoyed our game and I cannot wait to try it more. RECOMMENDED! Thanks to Asmodee USA for the review copy of Lords of Xidit! I await patiently for the detail elaboration of Tragedy Looper! Cheers!